The Rose Parade, also known as the Tournament of Roses Parade, is an annual tradition in Pasadena, California, that takes place every year on New Year’s day (or on Monday, January 2 if New Year’s Day falls on a Sunday.) The event was started in 1890 by members of the Pasadena Valley Hunt Club who wanted to showcase California’s beautiful winter weather. “In New York, people are buried in the snow. Here our flowers are blooming and our oranges are about to bear. Let’s hold a festival to tell the world about our paradise” they said and this is how it all began. The Rose Parade is one of the most awaited events of the year and is watched by hundreds of thousands of spectators from all over the United States, either in person or on multiple television networks. The parade includes flower-covered floats, marching bands, and equestrian units. The day before the parade, the streets and the neighborhoods on the route of the parade are sealed off and reserved for the marshaling floats and bands. The Rose Parade has come a long way since its early days. The new floats now feature high-tech computerized animation and exotic materials from around the world. From the design stages to the final day, the process takes about a year. The floats design has to be submitted as early as February to get approved for the following years’s January 1st parade. The construction begins around March and when finished the float has to undergo a test to make sure it’s safe and it drives properly. The decorating begins during the first week of December so they can be done by January 1st, when the parade starts. The first flowers glued in are the carnations and the chrysanthemum, because they are the most resilient. The last ones to go on the float are the roses, which are actually put in vials and stick them into foam. Seeing the Rose Parade in person is a great experience which you shouldn’t miss if you happen to be in Southern California for New Year’s Eve. If you are planning to attend, you’ll have to reserve your tickets way in advance and be prepared to get up very early in the morning. Traffic and parking on the day of the parade is a nightmare. Ticket prices change from time to time, but they range from $50 to $100 range per seat. Very colourful, Anda! 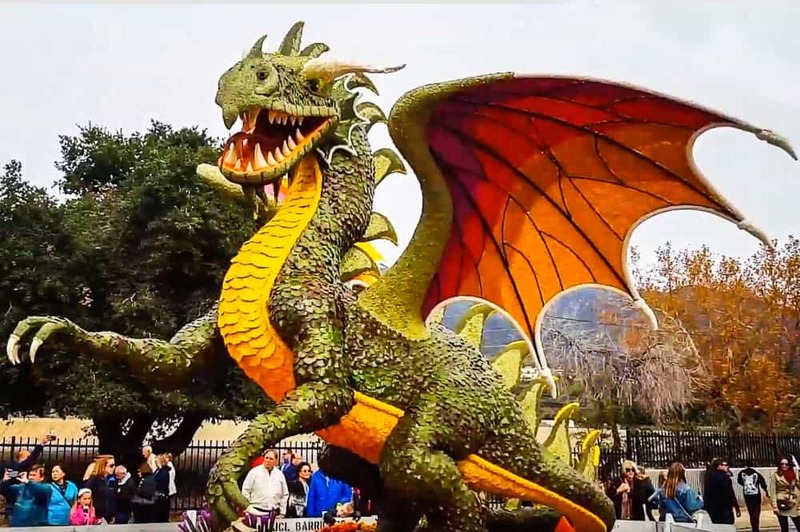 The Tournament of Roses Parade is something worth visiting! I have never heard of the Rose Parade. It looks wonderful. I find it a bit weird that you have to buy tickets to it though. I don't think I have ever before heard of a street parade that you couldn't see for free. You have to buy tickets to sit in the stands, but if you just want to watch the parade standing is free. However, the view from the street level is very bad because there are way too many people trying to get a glimpse of it.